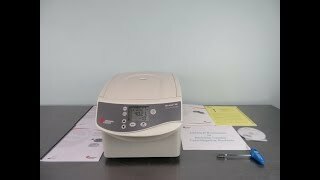 The Beckman 20R Microcentrifuge provides a compact and powerful centrifugation, with temperature control and high speeds. This microcentrifuge has a temperature range of between -10 to 40°C allowing users to work with temperature sensitive samples, making it an ideal choice for applications nucleic acid and protein preparation. The Microfuge 20R reaches speeds of 15000 rpm with a maximum RCF of 20627 x g. The digital control and microprocessor allows users to quickly navigate through system set up, set times, temperature, speeds, as well as program up to 10 protocols, and choose between two acceleration and deceleration profiles. Please note this unit comes new in box and runs on 230V power. This Beckman 20R Microcentrifuge is new in the box and comes with a clear bill of health. All of our lab equipment comes backed with our standard warranty. Should you have any questions, please don't hesitate to contact us.